Contemporary visual arts have been powerful tools in responding to times of sociopolitical instability and repression. Although multi-vocal and extraordinarily diverse, artists across the Americas have continued to create collective artworks that denounce asymmetrical power relations, resist the scandals of colonialism, dictatorships, and the systemic ways in which neoliberalism and white supremacy continue to exploit the Global South. These public performances stage acts of resistance while allowing for a praxis of collective testimony in the face of political oppression. Their artistic accomplishments reinsert suppressed narratives into the public sphere, establishing an inescapable relationship between artwork and viewers as witnesses. Throughout the last fifty years, artists such as Tania Bruguera, Lotty Rosenfeld, Nicholas Galanin, Michelle Angela Ortiz, Robin Bell, Favianna Rodrigues, have resisted and exposed oppressive political regimes, genocidal policies, and fascist governments while showing our complicity in remaining silent in the face of horror. A visual artist, skilled muralist, community arts educator, Michelle Angela Ortiz confers dignity and visibility to the stories of communities that have been erased, co-opted, and often lost. Through her art, she creates a space for dialogue, transforming spectators into participators who must move forward collectively, in response-ability, resistance, and solidarity. For over 18 years, Ortiz has used the arts as a tool to bridge and build communities. She has created over 50 large-scale public works in the U.S. and abroad and has led community building initiatives for social change in several countries. In 2015, she completed the first U.S. State-funded public art project since the re-opening of the U.S. embassy in Havana. You can read more about her work here. Photo Credit Jose Mazariegos. Ortiz installs the words of Ana, a mother formerly detained the Berks Detention Center. Joining her are undocumented families/ community members from Juntos. One of her projects, Familia Separadas, “is a series of temporary site-specific public artworks that mark locations and documents stories of immigrant families affected by detention and deportations in Pennsylvania,” Ortiz explains. The artwork consists of several phases, the first one having been installed on October 2015, in which temporary large-scale, site-specific public works were unveiled in several spaces in Philadelphia, including the Immigration Customs Enforcement Agency, Compass Rose at the City Hall Courtyard, Love Park, and 9th Street Market. During this phase of the project, she worked with undocumented youth and families in partnership with Juntos, a Latino immigrant rights organization. Photo Credit Jose Mazariegos. Alma and her children stand in front of Ortiz's art installation the ICE building. Alma who fought against the deportation of her husband, Javier. With the support of the Rauschenberg Artist as Activist Fellowship, Ortiz is developing the Phase 2 of the project and is interviewing mothers and children formerly detained the de Berks Detention Center. The Berks County Family Detention Center is a prison in the US where young children at the tender age of two weeks have been incarcerated. Ortiz is working closely with the Shut Down Berks Coalition and with mothers from the fourteen families that were detained at Berks for more than 2 years. She explains that “during that time the mothers organized labor and hunger strikes as they fought for their freedom. Ten families were deported back to their home country returning to the violence they were fleeing, and 4 families were released in the United States still fighting against their possible deportation and living through the trauma of being detained.” Currently, the Center continues to detain families as their license continues to be challenged in court. Even though the Center has a laundry list of human rights abuses and testimonies of the detained families have gone public, Governor Tom Wolf (PA) has not issued an Emergency Removal Order (ERO) that would ensure that families are not detained in the facility while the appeal case continues." Photo Credit: Steve Weinik. 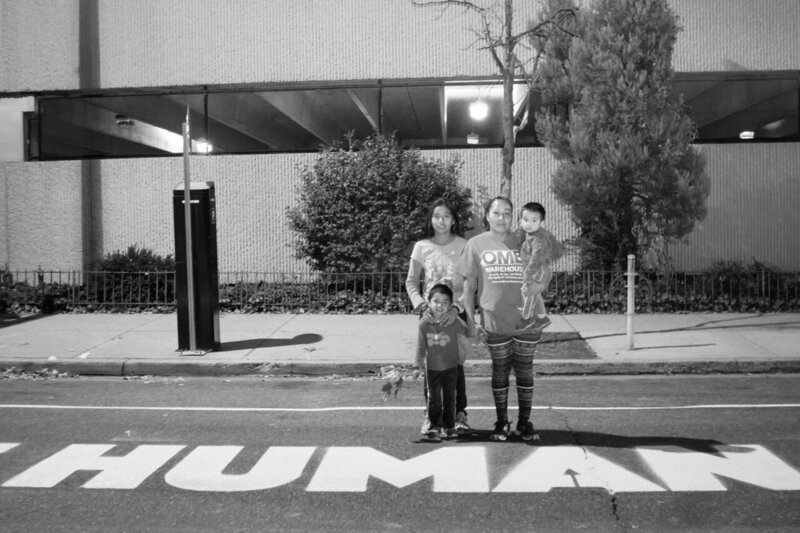 "We Are Human Beings" installed in front of the ICE building in Philadelphia. It's time to listen to Ortiz as she incites, provokes, and summons us to speak truth to power, occupy the streets, organize, call our representatives, learn, reflect, conspire, and combat these atrocities through an aesth-ethic. We have to be responsible for keeping these conduits of memory alive. We have to be critically awake (and conscious) to hear the sound or our collective voices beyond 45's weaponization of words and violation of life. As an actor friend reminded me, Bertolt Brecht described art not as a mirror to society, but a hammer (or machete) through which to reshape and reform it! To Brecht, the arts have to provoke us so much that we are left with no other choice than to act. Will you move out of complacency and complicity to join Michelle Angela Ortiz in denouncing and fighting against these atrocities? Here is an informed call to action if you want and can be involved in shutting down Berks, provided by Ortiz.